Primack Lab featured on French TV! This autumn, a crew from the Film Concept Associes of France came to Massachusetts to shoot an episode of the program Nature's Keepers for French TV. The program's director, Cecile Favier, interviewed us on the connection of our research to conservation issues in Massachusetts. She was particularly interested in how we have used the historical observations of Henry David Thoreau to measure the effects of climate change on plant and animal communities in Concord, MA. We had a great experience sharing our work with the French crew, and we will post a link to the program when it is available in 2015! At Great Meadow National Wildlife Refuge in Concord, Richard explains (with great emotion!) how Thoreau's phenology records can be used to demonstrate the impact of climate change on the flowering times and abundance of wildflower species. At Manomet Center for Conservation Science, Amanda describes her investigation into fruiting times, and how migratory bird species may be altering their diets in response to climate change and species invasions. Scientists are interested in knowing how a warming climate will affect the leafing out times of trees, and if leafing out times are earlier now than in the past due to a warming climate. If trees are leafing out earlier now, that could extend the growing season, and forests could be absorbing more carbon dioxide and producing more wood. However, until recently there was no good way to determine when tree species leafed out in the past. 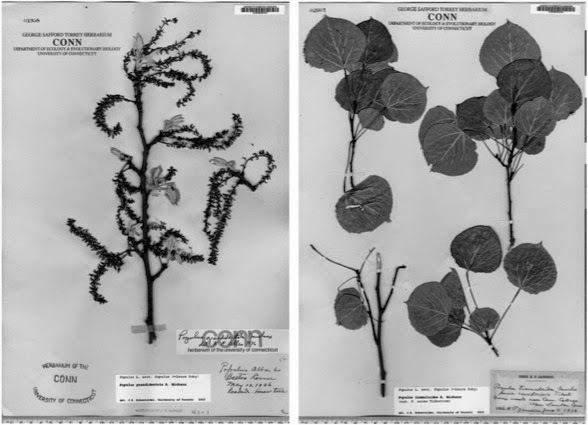 Figure 1.Two specimens of Populus grandidentata accessed online from the G.S. Torrey Herbarium at the University of Connecticut (EEB, 2004). Young leaves and flowers are visible on the left specimen (collected 10 May 1936), but only mature leaves on the right specimen (collected 8 June 1932). We have found that herbarium specimens of most New England tree species can be used to determine past leaf out times. These herbarium specimens are flattened dried twigs, often collected when the plants are in full flower. These specimens each have labels that show the date and location of collection. About 15% of the specimens also have young, unfolding leaves on them, and so can be used to determine past leaf out dates. 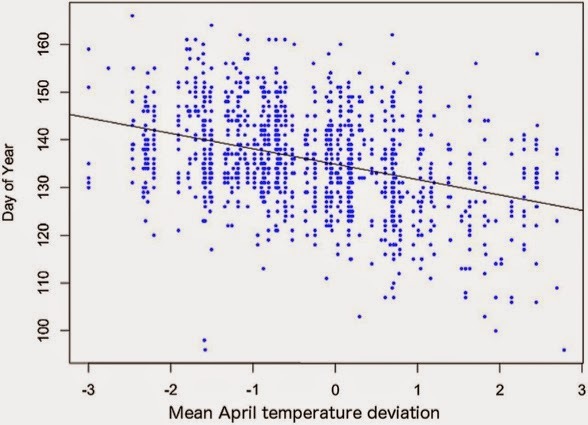 Using over 1500 New England herbarium specimens with young leaves, we were able to determine that trees in New England leaf out earlier in warm years than cold years, that trees are leafing out earlier now than in the past, and that trees leaf out earlier in warmer more southern locations in New England than in more northern and colder locations. This method promises to be useful to climate change biologists and ecosystem ecologists when applied to other areas and over larger regions. To see the full article, published in American Journal of Botany, click here.